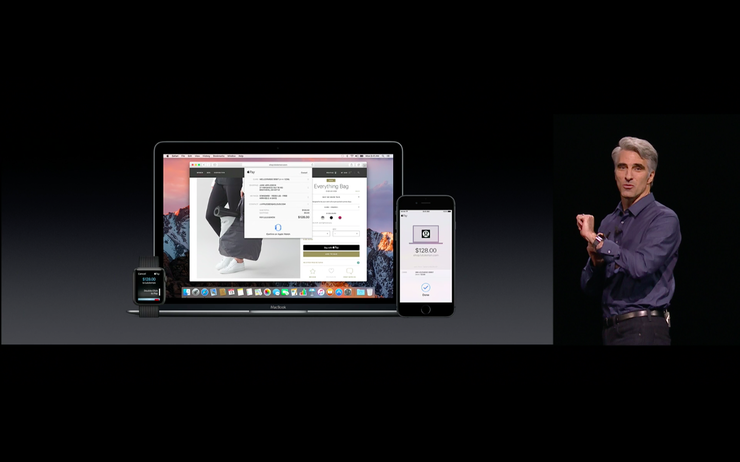 Apple Pay on websites launched on Tuesday with the release of iOS 10 for the iPhone and iPad -- and will hit Mac desktops when macOS Sierra launches next Tuesday. More than 200,000 websites -- including small and large retailers -- plan to support Apple Pay on their sites in coming weeks, Apple said Tuesday. Many of the sites include online retailers using e-commerce platforms run by Shopify, Demandware and IBM. The move means that online shoppers with iPhones, iPads and Macs updated with the latest operating systems can save time when finishing an online purchase through the Apple's Safari browser. Retailers that have signed up for the service are expected to see an uptick in the number of customers that finish a web purchase, instead of giving up because typing in credit information was considered too complicated, awkward or time-consuming. Apple first revealed the new feature in June at WWDC and recently posted a support page describing how Apple Pay has moved beyond in-store payments and in-app payments to website payments. Here's how it works: After searching out a product or service in Safari to purchase, Apple Pay customers need only click an Apple Pay button on a website to complete their purchase. For Mac desktops or laptops, after the pay button is clicked, a buyer will authenticate the purchase with a fingerprint scan on their iPhone or a double touch on their Apple Watch. Once Sierra is available, a Mac user must be signed in to the same iCloud account on the iPhone or Apple Watch as on the Mac, and Bluetooth must be enabled on the Mac, Apple said. On Tuesday, BigCommerce -- which has financial backing from web veteran Steve Case -- announced support for Apple Pay as well, potentially bringing thousands of startup and mid-sized online retailers into the Apple Pay for web ecosystem. Apple Pay "eliminates friction and streamlines checkout, thereby saving sales that would otherwise be postponed or lost," Jimmy Duvall, chief product officer for BigCommerce, said in a statement. It isn't clear how many major retailers are authorizing Apple Pay on websites this year, although Apple listed more than 70 companies at its june developers conference that plan to launch by the end of the year. (See comments at 41:38 from the presentation.) The list includes 1800Flowers, Abercrombie & Fitch, British Airways, Burberry, Conde Nast, Fandango, Hollister, Hotels.com, JetBlue, Lululemon, Nike, Office Depot, Saks Fifth Avenue, Staples, Target, Travelocity, Under Armour and United Airlines. Apple Pay on the web transactions will be protected by strong encryption, and Apple Pay will not track a person's purchases. "You no longer need to share credit or debit card numbers with an online merchant, and actual card numbers are not stored on your device, nor on Apple servers," Apple said in marketing materials for macOS Sierra. Instead, a unique number, called a Device Account Number, is assigned, encrypted and securely stored in the Secure Element chip on an Apple device. Each transaction is authorized with a one-time unique dynamic security code. Mobile payments with Apple Pay and other services like Android Pay and Samsung Pay haven't grown nearly as fast as analysts first projected. Most people in the U.S. still find it easier to use cash or a credit or debit card. The U.S. Federal Reserve found in 2015 that 75% of 2,137 people it surveyed didn't use mobile payments because of the ease of using other methods. Accenture said mobile payments in 2015 grew just 1% over 2014, based on a survey of 4,000 smartphone users in North America. Easier web purchases from smartphones and desktops with Apple Pay for web could increase the use of mobile wallets, because consumers will have grown more accustomed to the concept. "We won't see an immediate avalanche of people stop using credit cards to pay online, but using the iPhone as authentication is brilliant and should catch on over time," said Patrick Moorhead, an analyst at Moor Insights & Strategy. Because the iPhone becomes an alternative form of authentication, retailers and other creditors are lowering fraud risk and can either pass on that savings to customers or keep it themselves, he said. Amazon's success with its quick checkout process shows that convenience is important to customers. "Apple Pay is not the big hit for mobile payments that Apple wanted it to be, so the company is hoping it will gain more traction from online browser payments," said Gartner analyst Avivah Litan. "This objective may actually bear Apple some new fruit. Personally, I think the value proposition of Apple Pay on the desktop is higher than it is on mobile devices, mainly because it affords consumers more convenience online for purchases across multiple sites. " Litan added: "Whipping out a plastic card at a point of sale is frankly more convenient for many people than is initiating a mobile payment from a smartphone." In June, many analysts said PayPal online payments could be disrupted by Apple Pay on websites. But PayPal welcomed Apple's move and even called Apple a partner. "We welcome any developments that help people move away from the awkwardness of cash," said Anuj Nayar, head of global initiatives at PayPal in an email. "PayPal is committed to our vision of reimagining money and [we] have deep and long-running partnerships with many players in the ecosystem, including Apple." PayPal has a number of subsidiaries, including Braintree, which officially announced support for Apple Pay for websites last week in a blog. Braintree offers e-commerce tools to merchants. Also, PayPal subsidiary Venmo is integrated with iOS 10, meaning that Venmo users can send and request money on Venmo with Apple's Siri and iMessage, according to a blog posted Tuesday. Venmo is a free, digital wallet that lets users make and share payments with others for things like cab fare, dinner bills or even rent.